If you ask Pete or me what one of our favorite travel destinations was we'd both reply Villa de Leyva in Colombia. It's a stuck in time small village in the Andes Mountains a few hours north of Bogota. 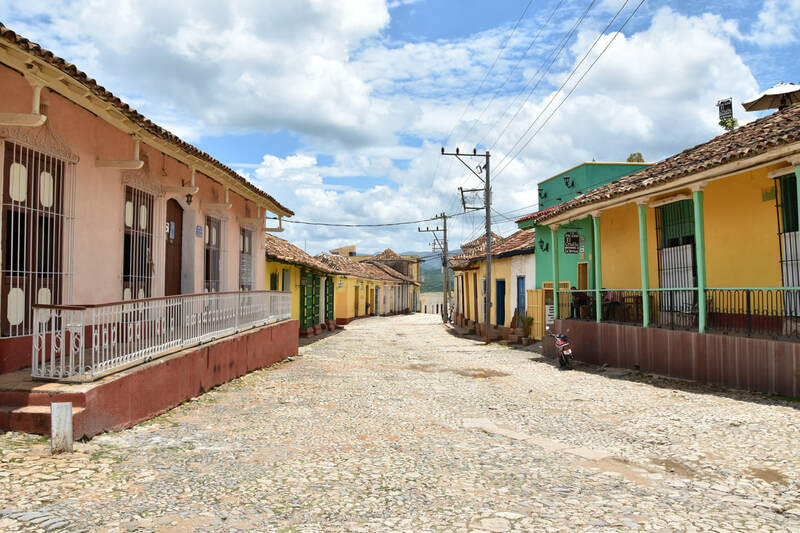 Whenever the Colombian entertainment industry needs to film an historical scene they head to Villa de Leyva because the buildings serve as a natural backdrop. Since that visit we've both tried to find similar small towns. 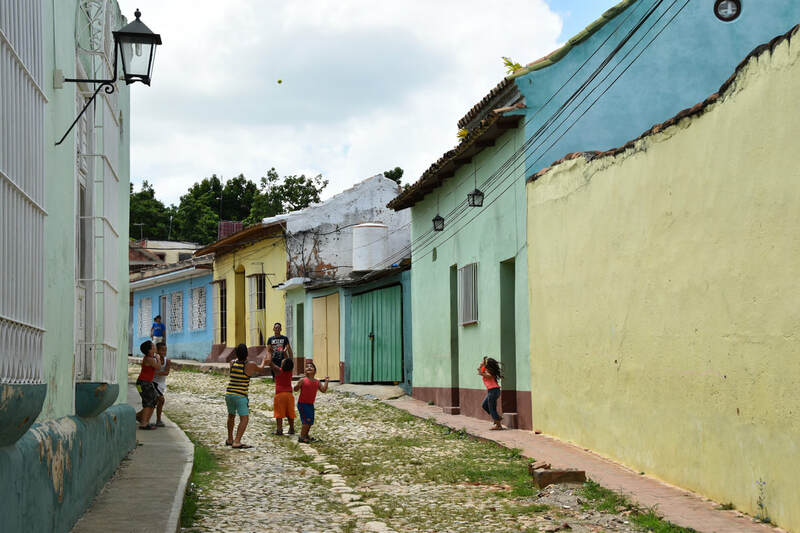 Cuba's Trinidad appeared to fit that mold. Trinidad is a designated UNESCO world heritage site. 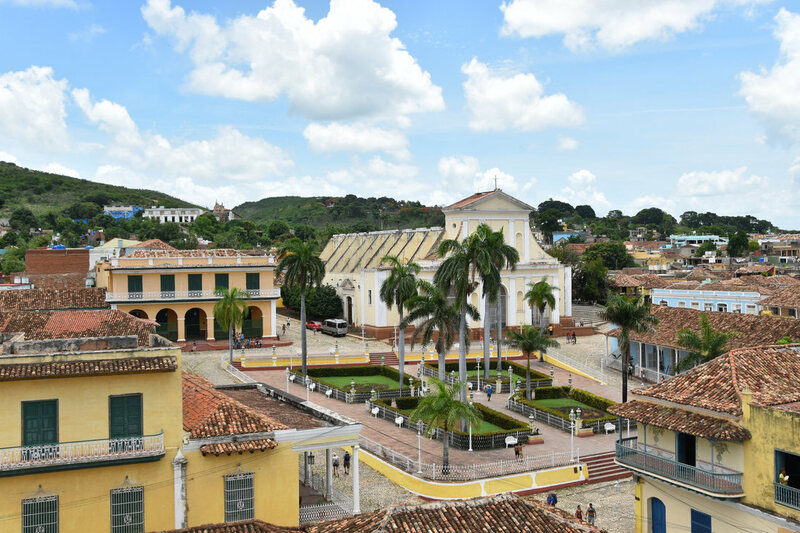 Colorful Caribbean homes line cobblestone streets with a church dominating the town plaza as a focal point. 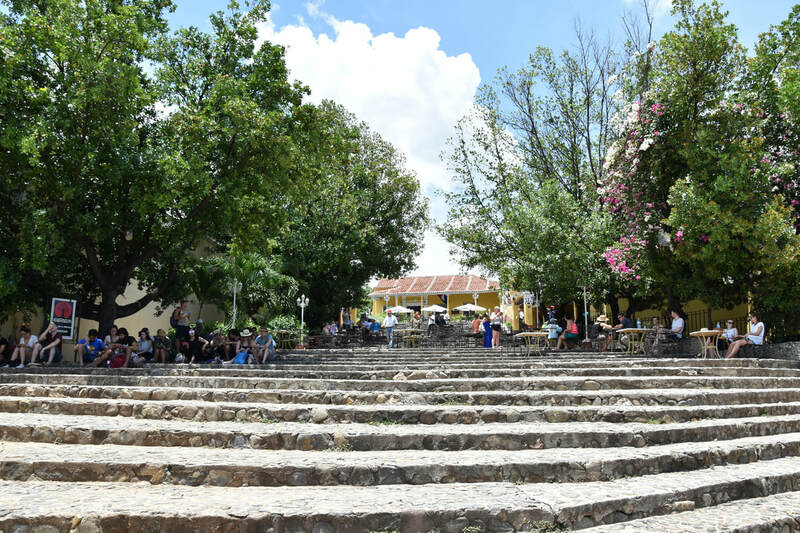 Villa de Leyva stumbled upon a time warp, Trinidad had a similar look but not the feel. 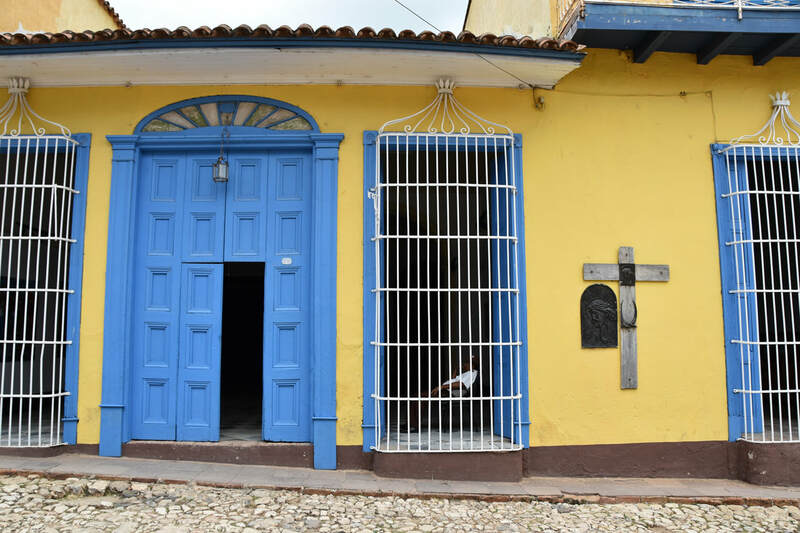 The knock against Trinidad is that the town caters to tourists whereas in Villa de Leyva the locals went about their business as the had for the past 100 years. In Villa de Leyva we were the only English speakers. In Trinidad there's more tourists and many of the business owners also speak English. 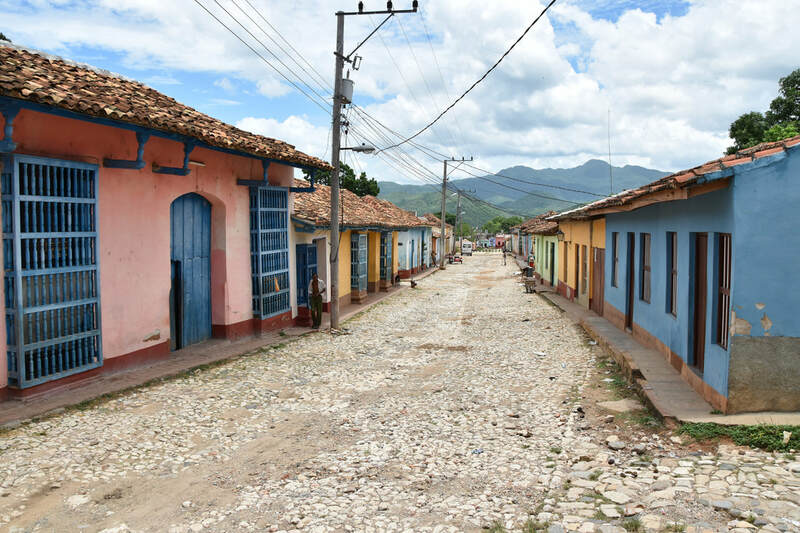 In Villa de Leyva we stumbled upon a time warp; Trinidad had a similar look but not the feel. ​ The photo of the car below? There were two other people taking photos at the same time. That seemed be the the central theme of Trinidad - beautiful photo opportunities, more tourists than locals, certainly in the town square area. If you are taking a taxi (or a bus) to Trinidad all roads eventually lead to Trinidad's town center. The town center is primarily a pedestrian only area because a combination of stairs blocks most of the access and the streets are so cobbled only the most aggravated driver would want to rumble across. At mid-day on a warm and sunny day, no one is walking around day - everyone has headed for the comfort in the shade on an inclined plaza next to the Church. The plaza also offers Wi-Fi. I crashed here after walking around the town and order an El Presidente. Heat and humidity must be a relative concept - the waiters wore long shirts and black pants and nary a bead of sweat ran from the brows. Just southwest of the church is a hotel/museum with a tower that provides panoramic views of the city and countryside. The view is good for getting your orientation but otherwise the rooftops block the street scenes. As evidence that Trinidad is geared towards tourism there were several stalls in the tower vicinity where you could a Che figurine. Trinidad also had more restaurants. More shops. Less "Cuba". 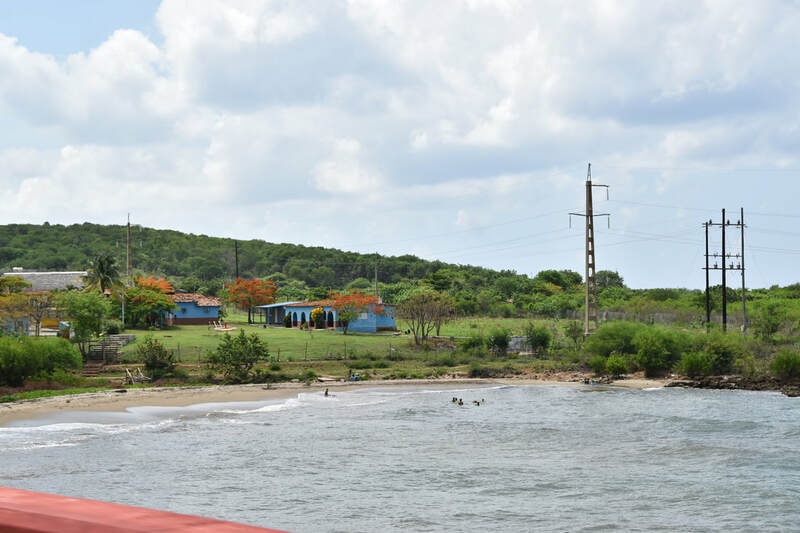 Compared to Havana and Cienfuegos the Trinidad shops, restaurants, and hotels are felt "forced" - there wasn't a natural setup in terms of location or product/services offered - Trinidad felt like a communist-free zone, so long as you sold to tourists. In the three hours we were here I kind of forgot that we were even in Cuba. Like Havana, the scale of the beautiful buildings is much larger than I expected. I was worried we'd drive four hours for a single photo of a red car in front of blue and yellow houses but the blue and yellow houses existed throughout the city. After leaving the panoramic tower we walked uphill to the streets north of the church. 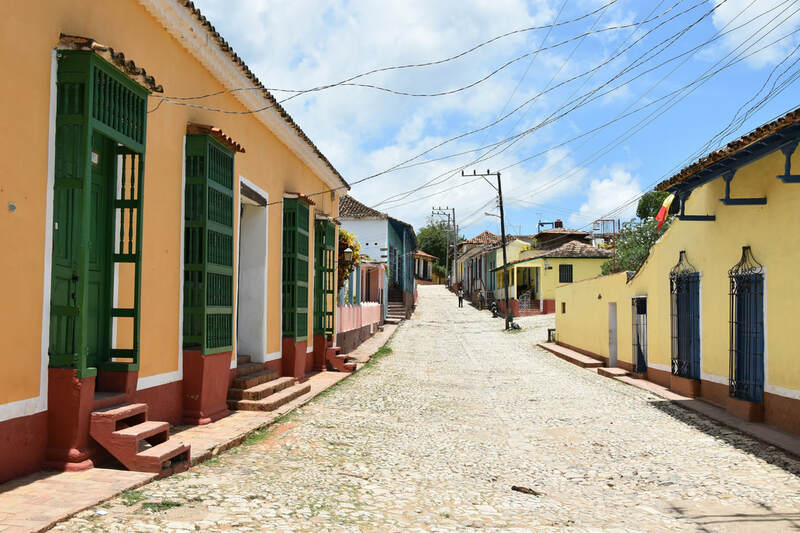 From various vistas we were able to obtain a full block view of the colored homes and cobbled streets. Those cobbled streets! I liked Trinidad, however, it seems like I keep talking about the drawbacks - another drawback. The stones in the street are at angles that could break your ankles. Don't wear flip flops or sandals. Near the end of the day Pete and I were taking breaks solely (pun intended) because our feet were on fire from all the sliding. When I grabbed a beer in the plaza, Pete opted for a foot massage. I thought maybe he was going through withdrawal being away from Singapore for two months, however, in hindsight it was a good move. Trinidad would be a good time to do a lazy afternoon bar hop. In addition to the plaza there were several rooftops where you could drink a beer and see the city. After the trip, I uploaded Pete's photos to my Flickr account. In Havana and Cienfeugos he took some great shots of things I hadn't seen. When it came to Trinidad...we took all the same photos. Even when we weren't walking together. 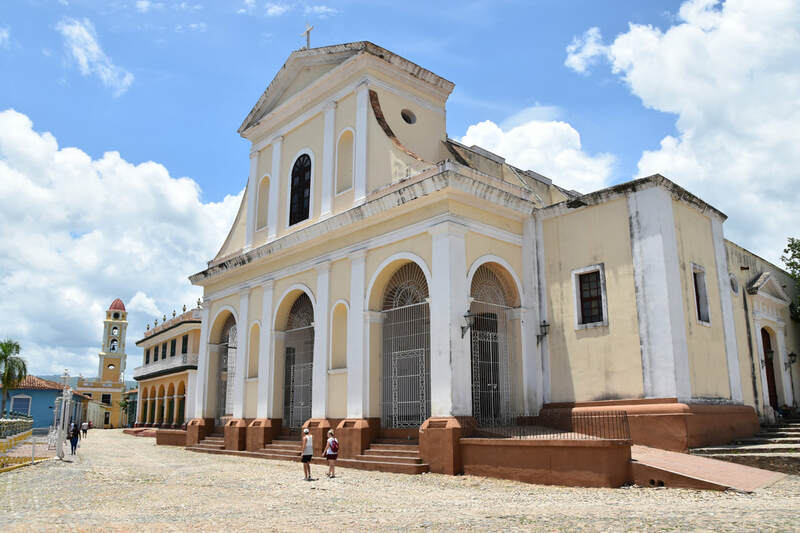 We spent about three hours in Trinidad which meant our combined Cienfuegos and Trinidad trip involved eight hours in a car and four hours wandering the towns. You may think that based upon what I've said about Trinidad that I regret the trip. That I wouldn't do this again or recommend someone to follow in my footsteps. But no. End to end it was a great trip. 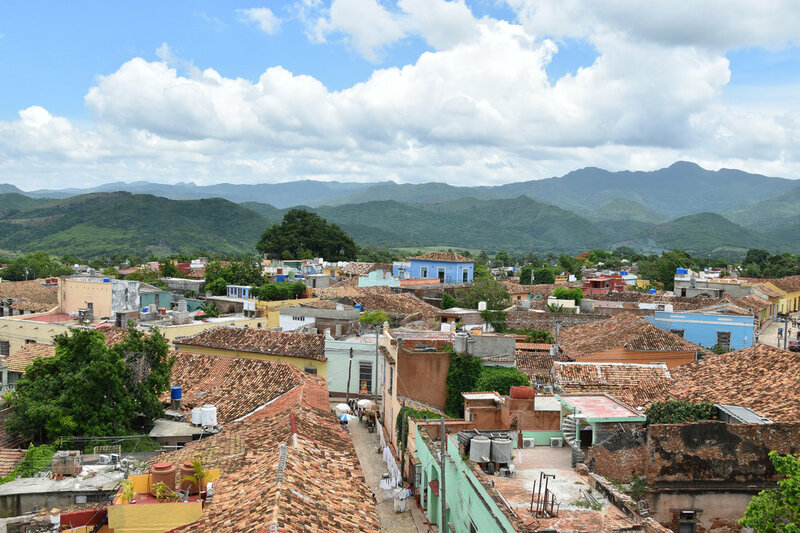 It was worth it to see another side to Cuba. Three hours felt like the right amount of time to spend in Trinidad. It would have been nice to arrive later in the afternoon and spend the night to see if things get a little wilder - do Cubans go to the rooftop bars at night? A day here would seem a bit too long although there are beaches nearby that could be reached easily via a taxi. 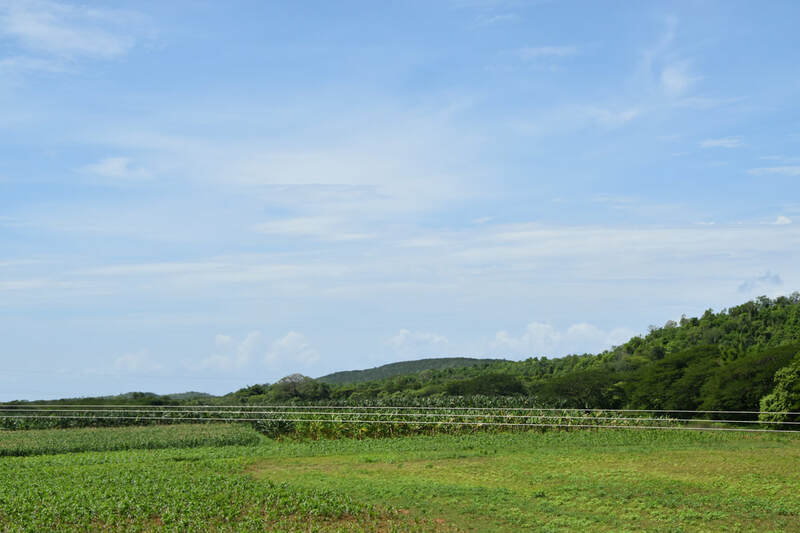 We spent eight hours in a car, I said I'd do the trip again, so this is going to sound crazy...but...the Cuban countryside is BORING. It's flat. It's green. It's more flat. It's more green. There's some beaches on the south side of the island. I really thought I'd see a lot of locals in the country side, that I'd see the "other" side of Cuba. There wasn't much there. Pete slept most of the ride, he didn't miss much. In Havana I saw glimpses of the city's glorious past. In the countryside I just saw the past...only now it was the present. If the communist revolution was suppose to bring greater economic wealth to the peasants, it still hasn't arrived. There's no cars. There's no tractors. The countryside is all horse power. It's a simple life.